In this guide we will look at some of the best waffle makers in our reviews and point out features that you may want to consider before buying a waffle iron. We’ll also cover how well they work and the difference between waffles, Belgian waffles, and pancakes. Why Get A Waffle Maker? Legend says waffles were first created when a man wearing chainmail sat on warm bread and pressed a pattern into it. This grid worked so well as a butter-and-preserve delivery tool that waffles became popular. Luckily, we can create delicious waffles in the comfort of our homes, sans chainmail. We think Waring currently makes the best belgian waffle maker. With this unit you can prepare two waffles at once. The first time you use the unit, you'll need to prime it with oil. However, once the waffle maker has been primed, it will be a true non-stick tool for real Belgian waffles with 1 inch / 2.5 centimeter waffle pockets. Gives you plenty of cooking space to prepare more than one waffle at a time. Lets you known when the unit is ready to cook and when the waffle is ready to serve and enjoy. Offers a wide range of cooking temperatures so you can experiment and customize. Makes great waffles, but doesn't do much more. Will require some dedicated storage when not in use because of a large footprint and tall design. Weighs just over 10 pounds / 4.5 kilos, so storing this in upper cabinets may be a challenge if lifting or reaching is a challenge. This unit offers six degrees of temperature choice and beeps when it's done pre-heating. Depending on the amount of browning you want, the waffle maker will also let you know when your breakfast is done. 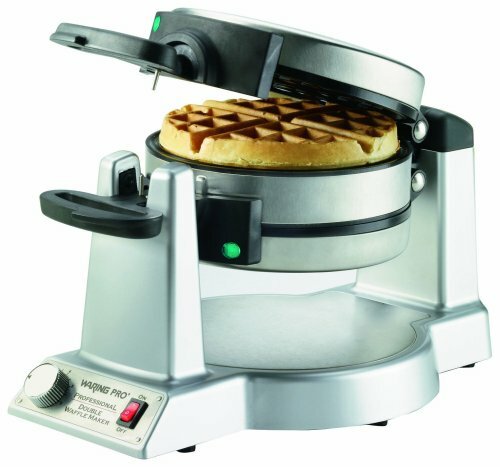 The WMK600 features a rotating waffle holder over a hot base plate. Once the machine beeps, you can add the batter, lock the lid down, and flip the waffle maker so you can add batter to the other side. The waffle flipping plate makes for a fairly tall unit. This waffle maker will need some dedicated storage space when you're not using it. If your kitchen is small, or if you just hate single-use tools, this may not be the best waffle maker for your household. 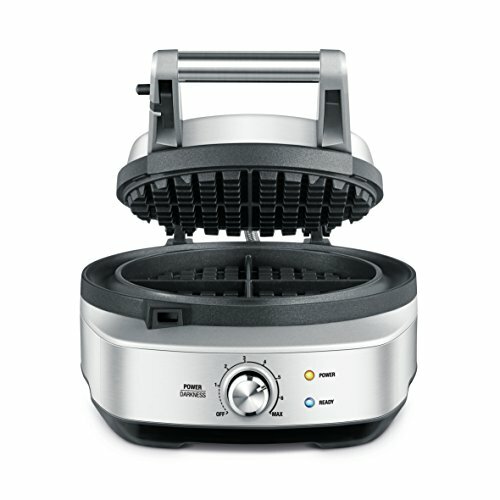 The Black and Decker Double Flip is a true Belgian Waffle Maker with deep grids and the traditional round shape. This unit prepares your breakfast with dual cooking plates and an easy swivel lid that locks in place once you've given it a turn. No fussing with temperature dials. The top rotates easily and can be locked in place. Nonstick finish makes cleanup a breeze. No temperature dial means you'll have to leave your waffles over the heat for a longer period of time to caramelize; you may find they become chewy. However, the Black and Decker doesn't offer a temperature control. Once it's plugged in, it's on. The red light comes on when the unit has power, and once the light turns green, it's ready to cook. Recommendations include loading both sides with batter, locking the unit and letting the green light come back on. This should give you a starting point on how long you need to let your waffles cook. The Black and Decker is a non-stick, straightforward double flip Belgian waffle maker. It's long and narrow, coming in at just under 7 pounds / 3.2 kilos. Both cleanup and storage will be simple with this unit. The Rome Waffle Iron is a cast iron tool that will work well over a burner and might even work over a campfire, though the handles are a bit short. This unit makes plain, not Belgian waffles, but offers great portability and a fun, rustic cooking style. Portable! No need for electricity when cooking with this unit. Well-seasoned cast iron makes for heirloom kitchen tools. Very flat unit at only 1 inch / 2.5 cm thick, so it can store easily. Cast iron is heavy, and when it's hot it can be dangerous to flip. The flipping mechanism is fastened with a hinged catch on only one side. The other "locking catch" is the grip of the cook. Turn with care! Cast iron can be hard to season for a true non-stick finish. The Rome Old Fashioned will need to be seasoned and have the seasoning maintained for quality non-stick cooking. This can be done with olive oil or bacon grease, and the directions are available from several sources. Once it's seasoned, quality cast iron can last for generations if properly cared for. The Cuisinart Belgian Waffle Maker can be used for several breakfast foods. There are several plates that come with the unit, and depending on what you install, you can make pancakes, eggs, sausage or waffles. All of the plates on this machine can be washed in the dishwasher. This machine is shaped like a small suitcase for easy storage. You can use it for more than waffles. All the plates are dishwasher safe. Plastic control features can be negatively impacted by extreme heat, so keep an eye on your control switches. Don't overload this tool; there is no run-off feature or drip pan. Check the rubber feet before it gets hot as they tend to fall off. The machine has top plates and bottom plates, carefully marked. The temperature control goes from 1 to 6 so you can control how brown your waffles will get. The Cuisinart WAF-300 comes with tongs built to make it easy to get your waffles out. 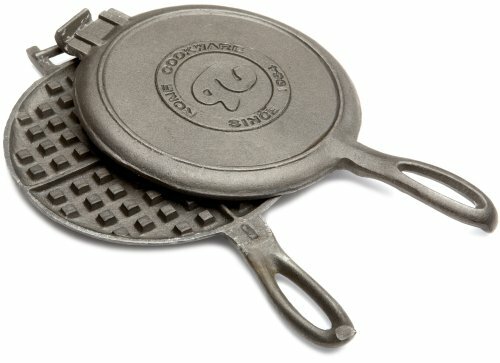 This unit does not flip, but it is large enough to make 4 square waffles in a 9.5 inch / 24 cm grid. Brush the hot plates with a bit of oil, fill the lower plate with the recommended amount of batter, spread it about a bit, and close the top plate. The waffle maker will come back to temperature, and later it will let you know when it's done. In true All-Clad fashion, this waffle maker is built of stainless steel and has a solid feel. Nearly all the components, with the exception of the control knob and the feet, are stainless. 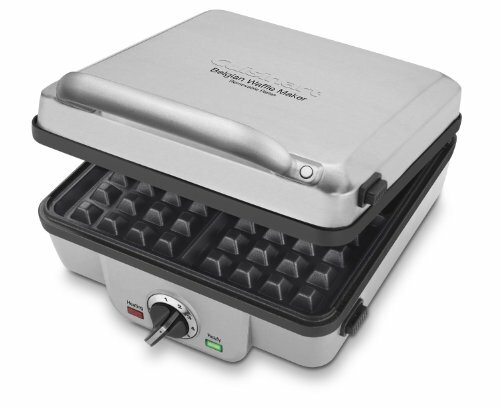 This unit makes 4 section waffles and offers 7 browning settings for a perfectly crisp waffle. This unit beeps when the waffles is done for prompt removal and level of brown. The temperature array makes it possible to carefully control the heat applied to your waffles. This unit includes lights that let you know when it's hot enough to cook. The heat source can be inconsistent, making it hard to fully cook waffles without burning. The steam-release system can negate the non-stick feature, making it hard to get waffles out of the pan. Because the waffle plates are not removable, this unit can be a challenge to clean. However, the non-stick surface doesn't always release the waffles when they're done, leaving you and your diners with sticky bits of breakfast. Concerns about inconsistent heating may also be contributing to the failure of the waffle to release from the pan. This unit is built to make excellent waffles. The temperature controls offer seven different selections, and this unit heats up quick. It also features a very long cord, so if you plan to prepare waffles for a brunch or special occasion and need a bit more room, the Breville may be a great choice. The top looks for easy storage and this unit will not open up when you're pulling it out of the cupboard. The Breville lets you know when it's hot and when it returns to the requested heat after adding the batter so you can watch your cooking time more easily. This unit offer higher cooking temperatures than many electric waffles makers for a rich, brown waffle. The drip edge can make it hard to get your waffles out; consider brushing the edge with some oil. The waffle plates are not teflon but cast aluminum, so sticking may be an issue. This is another tool that does only one thing; many home cooks don't have the space for such a tool. It will beep when it's hot enough to cook, when it returns to cooking temperature after you've added the batter, and when your waffles are done. While the Breville offers a "moat" or run-off channel for extra batter, this extra batter can make it extremely hard to get cooked waffles out. While it may save you some clean-up, you're best off not to overload the Breville waffle maker. Small waffles may not look perfect, but they're much less messy. 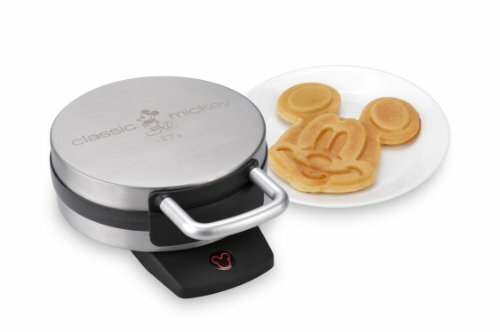 The Mickey Mouse waffle maker is a lightweight unit makes an adorable patterned pancake featuring Mickey Mouse! However, most cooks agree that the plates don't really get hot enough to cook to waffle standards such as caramelizing the waffle mix and browning the final product. It's Mickey! What a delightful breakfast treat. The flat plates do an excellent job of sculpting and cooking the pancake batter. You may need to put this tool away for the next generation of Mickey pancake fans. There's no temperature setting available, so once the plates are hot enough for pancakes, you'll need to work quickly. This should not impact your guests at all, but anyone interested in this tool would be wise to start with a pancake batter for the first batch, just to make sure it cooks properly. Waffle makers are available in a variety of materials. From an old fashioned cast iron unit to an electric non-stick, these handy tools help you create breakfast staples that look great and taste delicious. They can also be used to bake up a quick batch of cookies or brownies. The biggest risks when making waffles are sticking or squeezing. If the plates of your waffle maker stick to the batter, you'll destroy your waffles when you try to get them out of the pan. If excess batter squeezes out around the edges of the waffle grid plate, you'll have a gooey, sticky and extremely hot mess to clean up. Waffle makers can be stove top tools or have their own power source. Depending on your storage capabilities, you can select the unit that works best for your space. Generally, if you want a stove top old fashioned waffle iron, it will be made of cast iron. It's important to note that cast iron is extremely durable and will last for years. However, these units need maintenance so they don't lose their seasoning and become sticky. Additionally, cast iron is quite heavy. If physical limitations restrict your hand strength, you may struggle to cook with cast iron. Non-stick Teflon is a common material for electric waffle makers. This product requires careful handling and storage so you don't scratch the surface and remove the non-stick coating, but when treated well, Teflon waffle makers release waffles easily and make clean-up a breeze. A waffle maker with removable plates can help a great deal with clean up. First of all, you can access all sides in case of batter leakage, and secondly the whole unit will cool down much faster when the plates are off the heating element. Additionally, you may be able to purchase custom plates from the manufacturer with different characters or themes to delight your young diners. If you're using a rotating or flippable waffle maker, a steam guard on the handle is critical. Hot pads and oven mitts can only do so much, and you'll need dexterity to lift and flip the waffle grid. Temperature controls are critical; most electric waffle irons offer an adjustable temperature so you can select your favorite level of crispiness. It should be noted that waffle makers are not tools to be left alone or walked away from. Depending on the size of your household, you may want a larger waffle maker for larger batches. One at a time, waffles can be time consuming. However, there are several units that will make at least four waffles at once. You can also purchase waffle makers that create waffles with scalloped exteriors. When whole, these waffles look like flowers, but you can split them like a pizza to serve. While Belgian waffle makers generally make one at a time, these round waffles are often quartered in their construction and can be easily split. Look for a unit with an auto-shutoff feature. While the best plan is still to unplug the unit immediately after the last waffle and pull the removable plates as soon as possible, it's very easy to forget the last step in an effort to enjoy your breakfast! An auto-shutoff feature will save you that worry. Review the cord placement before you purchase an electric waffle maker and make sure it's easy to access if things get too hot. Obviously, you'll want to unplug the waffle maker from the wall before you start disconnecting anything at the machine, but electricity and extreme heat are not a great combination. If your waffle starts to smell burnt, it's a good idea to disconnect from the wall for safety and then from the waffle maker to save your power cord.​ Be careful, it may be hot! Finally, get creative! Enjoy custom plates with various themes such as movie or book characters to delight your kids and make fixing breakfast together even more fun. There is a marked difference between pancake and waffle mix. Waffle batter requires more sugar so the waffle exterior will caramelize and get crispy. Waffle batter also needs more fat due to the intense heat inside a waffle maker. What is a Belgian waffle? The biggest difference between Belgian waffles and regular waffles is the leavening agent. Traditional Belgian waffle batter contains yeast, not baking powder, so the dough preparation takes longer. Belgian waffle makers have a taller grid pattern to allow for the traditional deeper grid pattern. While traditional waffles are generally served with butter and syru﻿﻿p, Belgian waffles are often served with fruit, whipped cream or ice cream. Cookie dough and thick brownie dough can be set on your waffle maker and pressed. The crisping process will generally take less than 2 minutes, and you can dust them with powdered sugar for a pretty presentation. While a large batch of cookies may be too much for a single waffle iron to handle, you can whip up a small batch without firing up the oven for a yummy and unique treat.